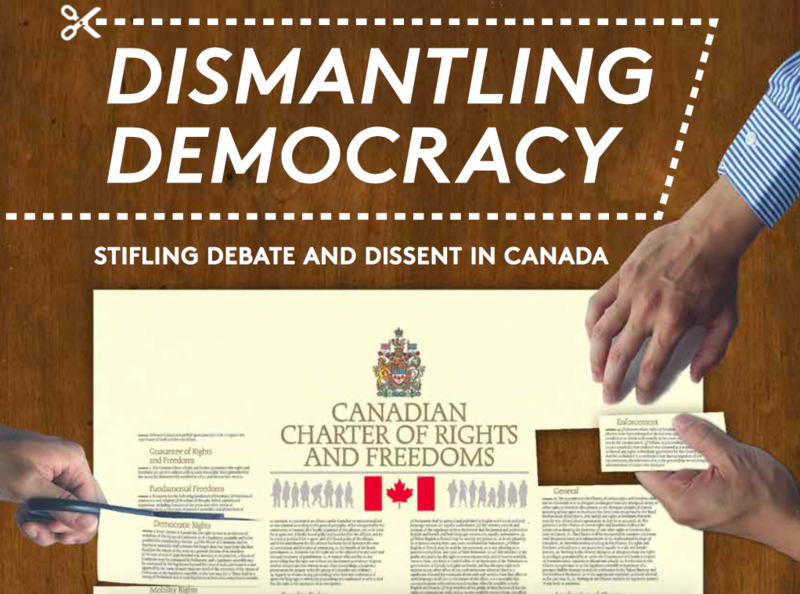 In Dismantling Democracy: Stifling debate and dissent in Canada, Voices-Voix documents the abuse of parliamentary rules, the intimidation of public servants, and the defunding and intimidation of organizations that hold views at odds with the government. The report documents where the federal government has gutted the capacity of its own departments and independent agencies to offer information and analysis needed to make sound policy choices. From scuttling the long-form census, to muzzling scientists, to cutting funding for evidence-based advocacy, the report argues that the government has pursued a deliberate strategy to repress alternative views. Voices is calling on Canadians to press politicians for clear commitments to uphold rights, promote healthy dialogue and strengthen democracy. Share the report by clicking here for Facebook, or here for Twitter. Add your voice, by signing the Voices-Voix Declaration here. This entry was posted in Resources on 5 June 2015 by ICLMG CSILC.